Nelson Quong feels a deep sense of gratitude since he has stepped back and widened his view on the world. It was a process, he admits. He has learned not to expect life to be as he planned, but rather to experience life as it unfolds before him. “I learned finally, its not about looking back, but about going forward” says Nelson. As Nelson’s post-accident life unfolds, he is deeply grateful for what he’s experiencing. He is learning that motivation and inspiration come from unexpected individuals in his everyday life. He describes these individuals as heroes who are willing to truly be themselves. They are not afraid to be vulnerable in their need for assistance, despite potential judgment and they instil confidence in others to do the same. 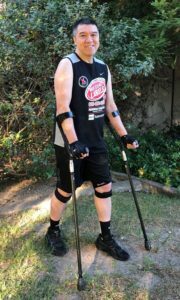 As a highly trained athlete, Nelson can apply sports rules to his new life of mobility challenges. This allows him to tolerate his chronic pain and set doable personal goals. 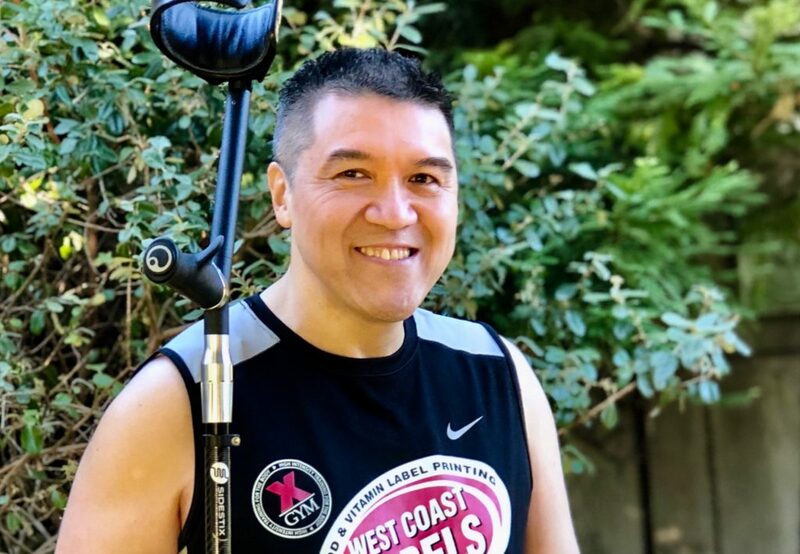 Best of all, moving forward has allowed Nelson to tap into an unexpected reservoir of strength, allowing him to overcome obstacles each day by just living well. For those who witnessed Nelson’s recovery, its easy for them to see he is fortified with the tenderness of gratitude and this is indeed inspiring. Nelson is an unexpected hero. I thoroughly enjoyed talking with him and hearing how his life continues to unfold, in the best of ways. Nelson – Hi. My name is Nelson Quong. I’m from Sacramento, California. And I had an impact injury to my left knee about eight years ago. I have lasting tendon damage and nerve damage for my knee down to my foot, and I’ve also gotten compensating injuries to my right knee and also to the ulnar nerve in my left arm. 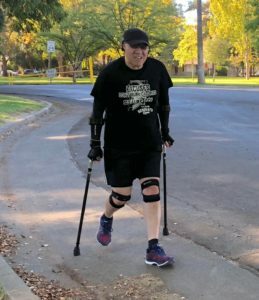 SideStix has helped me not only to give me more confidence as far as getting around every day, but has also reignited my passion for athletic endeavours and has taught me to modify my goals. And I’m just looking forward to my future with SideStix. You were an avid bike racer before your injury. Can you tell us a bit about how you’ve adjusted to maintaining that athleticism in your daily routine? Nelson – I’m thinking about if I would have been injured ten years earlier – with everything that you’ve (Sarah) been through, from such a young age, your challenges, you’re developing SideStix and starting the company – I wouldn’t have the advantages that I have now. The first time I bought a racing bike, I thought I’m not gonna be good enough for this. If I get a time trial bike, I want to be flexible enough and I want to make sure that I deserve this. I’ve had two major surgeries and another eight experimental procedures done. I was really depressed when the first doctors told me that I’m just not going to be an active person. I mean, I’ve been bike racing for just about 17 years. My life was running and had just started doing these stair climbs. We did the Stratosphere, and Sears Tower, and all these different buildings. And then the doctor said that I’m not going to be able to do that anymore. I contacted a surgeon, the ex-speed skater Eric Heiden, in Salt Lake City. He’s working on the U.S. speed skating team in Salt Lake City. I said to him, that my doctor told me that I’m not going be able to stair climb buildings, or race bikes. He turned me on to his sports team, that he started here in Sacramento. They’re all doing something that they couldn’t do before. My last visit with Eric’s team, I actually brought my SideStix, and I told them that I’m starting to “run” with them again. They’re so comfortable for walking and even running; something that I couldn’t do before. When I tried walking with my regular crutches my hands were going numb, and my arms were going numb. How did you first hear about SideStix? Nelson – I was one of those people that were on the fence, I wasn’t sure if I deserved it. I’d read a lot about it probably for a year. One day, I was going to the gym and I met a lady there. She was holding one SideStix. I started asking a lot of questions like, are those carbon fiber tubes? Are those shocks? Can you really feel them? She said that they’re not that noticeable and that her wrists have never been sore or numb since she started using SideStix. Then she said I could try them and so I did. She had the bio grips at the time and she said that she bought the SideStix years ago. We were talking about where we parked. I told her that I have a disabled placard and that I try not to park in those spots, incase someone needs the spot. She said that I need to get over that stuff and I should use it if I need it. When she said, “that I need to get over it” that actually triggered something in my brain. My doctors were telling me years ago that I should talk to someone about these feelings. But I felt like I was fine. I thought, once I get back into bike racing I’ll be fine. Exercise used to be my way of dealing with social anxiety, and I’d forgotten all about this, but dealing with depression and after I got injured it all came back like a storm. It got to the point where one time I was driving with my sister and my niece and I asked them to pull over. I said, “I need to run.” And I can’t run, so I was pretty much just limping down this farm road and limping back to their car a couple of times. There I was having a panic attack and I needed to get that energy out. I kept saying that when I get back, when I get back to where I was… When that lady at the gym told me to get over it, it sparked something. Now, especially with the SideStix, I have goals again. I mean, I want to do a race and I want to do a run. I want to do a half marathon. I’d like to do a marathon even if I don’t make the cutoff. It’s not about going back to where I was, it’s about moving forward. And that’s where I am right now. Now I have the tools to help me do that. When I got my SideStix for the first time, it was just like the first time that I rode a bike. It’s like freedom. What’s your definition of Defy Convention? Nelson – I think, especially for those of us who were athletic before, we forget to apply the rules of sports into life. I’m starting to do this now. I’m starting to see the analogy more. If I was gonna climb the Sears Tower, I’d say that this is what it’s going to take to get to the top, then this is what it’s going to take to get to certain points. I want to get to those certain points efficiently, so this is what it’s going to take to get to the next floor. But then, it gets down to, this is how I’m going to take each step. Everything’s a step forward now. I didn’t look at it that way before but every small step has a meaning. This actually makes life better when you appreciate that. And I’m grateful for it. For me this inspiration just goes on and on and on and everyone can be motivated by someone. I was just amazed by that. You can’t really compare. I think this guy has it a lot worse than I do and yet he’s doing this and he’s doing well. It’s just like everyone becomes your hero. Nelson – Well, of course anything athletic, but I also like to write poetry for myself. I don’t know if it’s really my passion. My family is part of my passion. I think, it’s just helping people. Hopefully making someone’s day better or easier. Especially when you know what it’s like to have challenges; not have the best day, or to be depressed about something, or frustrated about something. I guess everyone has to go through it to some point, but I don’t want them to have to go through that alone. If I can help I would love to be able to help them. I’ve been thinking about starting to do some volunteer work. I don’t want anyone to be out there just feeling lonely or just feeling alone. If I can help I want to be able to help them. My friend was saying her son has Down Syndrome and they had this program, where part of it was that they were gonna teach him how to ride a bike. But they couldn’t do the whole program. She said, “How would you feel about helping someone, whose life would really change, by learning how to ride a bike?” I got goosebumps when she asked that, and I told her that I would love that. I would love for someone, that really needs to feel that freedom, to do it. So that’s something, that I’ve been seriously thinking about, even talking to some of my doctors about, because I know they have connections to a Children’s Hospital. What’s your favorite thing about SideStix? You said there’s a lot but if you had to identify one thing what do you think it would be? Nelson – That’s gonna be the toughest thing, to pick out just one. Nelson – Okay, maybe from the bike geek part of me, I love the carbon fiber. And not just for it being carbon fiber, but for it being strong and yet giving. The second thing is, that I absolutely love the FinGrips. Because even though it has that perfect hand position, which I do use, I also use it just with my palm straight up, almost like the handle bars on my bike. It is a comfortable change. I mean, I couldn’t even run for a few steps, but with my SideStix, I’ve gone from two miles, to three miles, to five miles, and I haven’t had them that long. So, to answer your question, for the comfort, I’d say the FinGrips… and the carbon and the shocks too. Could you share a few ways that you stay motivated? Nelson – Just spending time with family is one. Spending time with friends. Definitely getting my workout in. Spending some alone time, maybe reading, that type of thing. Maybe either watching a motivational video or listening to music. Do you have a message that you could share with other crutch users? Nelson – You know that there’s so much that you can accomplish. You never have to give up on goals. The goals sometimes can just be modified. As far as me, I had goals that I wanted to accomplish before, but now with a great set of crutches, those challenges are going to be ten times what they were. The satisfaction, the sense of fulfillment, is gonna be tenfold. And it already is. Admiring each step along the way, it already is. You can still achieve that sense of accomplishment to the same extent, if not even more. I think it’s really easy, to just kind of hideaway, like if I were to have just listened to those first doctors, tell me that I’m not going to be able to do all these things. Tell me that I’m supposed to just take pain medication the rest my life. I think we all have this inner athlete and that’s always gonna be there. It’s always going be there no matter how bad things get or how challenging things get, we always have that same mindset.